Conwy Home Maintenance is dedicated to providing a comprehensive home electrical maintenance service for property owners, property professionals and businesses in the counties of Conwy, Denbighshire, and Gwynedd. Working with First Time Buyers, Home Owners, Property Investors, Estate Agents, Landlords and Solicitors. I have a Disclosure and Barring Service (DBS) certificate. The DBS enables me to offer a Portable Appliance Testing (PAT) service to hospitals, GP surgeries, nursing homes, nurserys and schools. Conwy Home Maintenance offers a comprehensive range of electrical services and outdoor wooden structure construction; fencing, decking, sheds, power and lighting to outbuildings, deck and garden lighting, weather proof sockets, Etc. Please click on either Outdoors or Indoors to get some idea of what's covered. If you dont see what you're looking for, feel free to contact me. Autumn and Winter 2018/19 Special Offer. 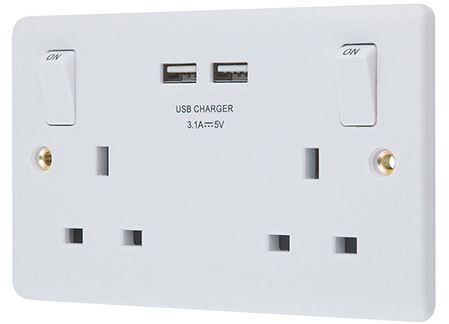 A 2-Gang 13A Switched Socket & 3.1A 2-Outlet USB Charger, supplied and fitted starting at £50. Free-up your sockets from having to plug in chargers for your phone, i-pad, tablet, etc. No more worry about overheating chargers. Buy 5 units and get one free! Call or e-mail for a no obligation quote. PAT testing can be a confusing subject regarding legal requirements obligations expected of Employers and Landlords. Click here for an explanation of what is expected, why and when. Last Update: Sunday, 17-Feb-2019 .